Almost 2,000 new species of plant have been discovered in the past year, according to a report by The Royal Botanic Gardens at Kew. 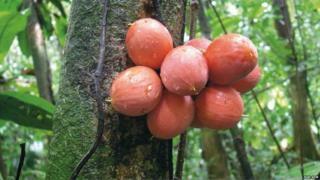 Many have potential as food crops, medicines or sources of timber. However, scientists say some of the newly-discovered plants are already at risk of extinction. They are developing new ways to speed up the discovery and classification of plants to help safeguard them for future generations. The second annual assessment of the State of the World's Plants by scientists at Kew found that 1,730 plants were recorded as being new to science in 2016. They include 11 new species from Brazil of the Manihot shrub known for its starchy root, cassava. Seven species of the South African plant best known for red bush or rooibos tea were discovered, of which six are already threatened with extinction. Other discoveries include new relatives of Aloe Vera, widely used in the cosmetics and pharmaceutical industries. Prof Kathy Willis, director of science at the Royal Botanic Gardens, Kew, said the new discoveries hold "huge promise" for the future. "It's really important to find these new species because they may well hold the genetic code - or the key - to more resilient food crops from pests and pathogens and climate change into the future," she said. "If we lose those crops or plants that provide really important natural capital for human well-being - so for example plants that draw down atmospheric carbon dioxide, plants that maintain and enhance our soils, plants that are important for fuel, for medicines, for fuels - if we lose those, that's the end of humanity." Researchers at Kew are trying to identify which plants are most at risk of extinction by looking at the global distribution of plants and the identification and naming of new species. The knowledge is being used to designate protected areas for plants around the world, including several in Africa. Kew's seed conservation project at Wakehurst Place in Sussex stores more than two billion seeds from global plant species as a "living collection of seeds". Lara Jewitt, nurseries manager at Kew, said some of the plants kept in the nurseries at Kew are the last of their kind in the world. "We have about 10,000 species here, 29% of which are natural source - so that means they've been collected from the wild," she said. "That makes them much more important for conservation, for scientific research, for restoration. This is a living scientific collection - so it's incredibly important." Interesting specimens include an orchid from the forests of Cambodia that was brought back to Kew for further study. It has flowered in the tropical nursery, allowing it to be identified as new to science. "In the tropical nursery we have a target list of everything's that endangered," said Lara Jewitt. "My team pollinate those plants and they collect seed. Then that seed gets banked in the Millennium Seed Bank and that's banked forever." The report also revealed that a growing number of plants have had their genomes sequenced to find out more about their biology. The tally now stands at more than 200, including food and drink favourites such as pineapples, strawberries, coffee, wine, chocolate and beer. At least 28,000 plants are now recorded as being of medicinal use. Increasing demand for herbal medicines is threatening wild populations of many of these plants. The report focused on Madagascar this year, where 83% of 11,138 native species occur nowhere else on Earth. At least 1,600 are judged to be at risk of extinction. More than 6,000 species of plant are now documented as invasive. More than 30,000 plant species are currently listed under the international trade agreement, Cites, to ensure international trade does not threaten their survival.